Here's a beautiful girl to bring home to your foundation row. She's a beautiful Jericho daughter, and a daughter of our 6 time champion black dam, Dazzlyn. Soul Sister is show quality, and you can review her show record to verify that we are correct on that. This girl is in the blue and red ribbons regardless of competition! With Soul Sister's black points, we expect her first cria to be black, as she is now bred to black! Jacob Black, that is! This is a very nice Jacob Black girl.................She has lovely crimpy fleece with a wonderful handle. Her dam, Soul Sister, was a many time blue ribbon winner, and her sire, Jacob Black, won 19 banners in the show ring. Soulmate has great conformation. She is a stylish female. When it comes to breeding this summer, you can choose a grey option, Irish Meadows Showtime, a 6 time champion grey, including champion banner at the prestigious Futurity show. Showtime is awesome, and he is a beautiful light silver grey. 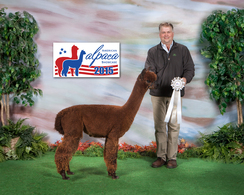 Or you can choose Destinati, our 9 time champion light fawn sire who has already thrown bay black. Either way, the cria will be spectacular! Pick up this wonderful female today!